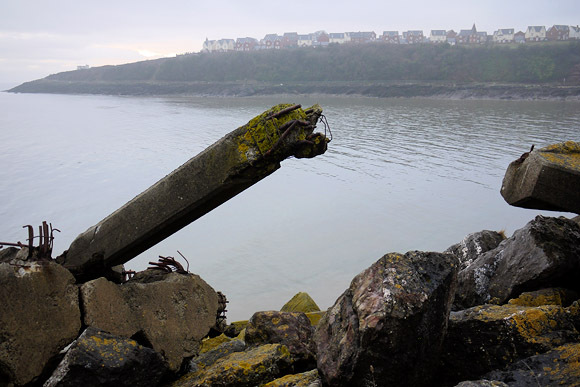 Located at the entrance to Barry Docks to the east of Barry Island can be found this old breakwater, complete with a rusting railway track leading to the lighthouse at the end. 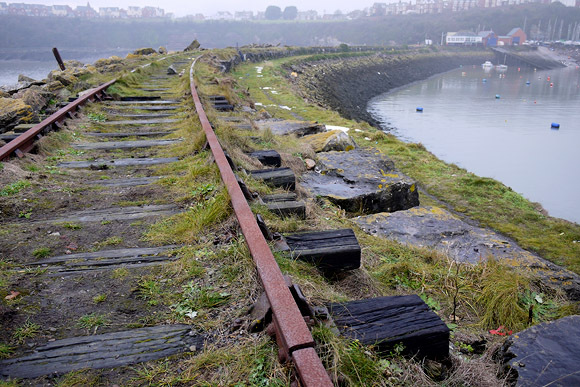 Built by David Davies from 1889 onwards, Barry Docks handled vast amounts of coal from the south Wales valleys, peaking in 1913, when over 11 million tonnes of coal and coke passed through the port. 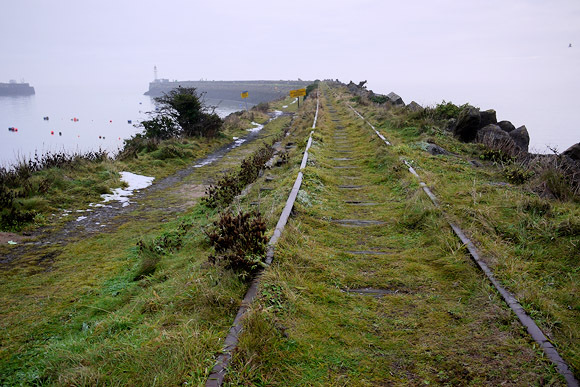 The coal export trade has now long gone, leaving the area littered with industrial archaeology and abandoned workings like this derelict breakwater. 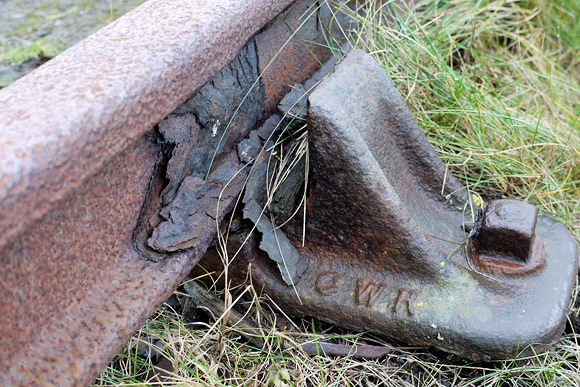 Curious items linger on too, like this strange building mounted on rail wheels, which can – in theory at least – traverse the rusty railway track. The blue door and balcony of the wheeled shed. 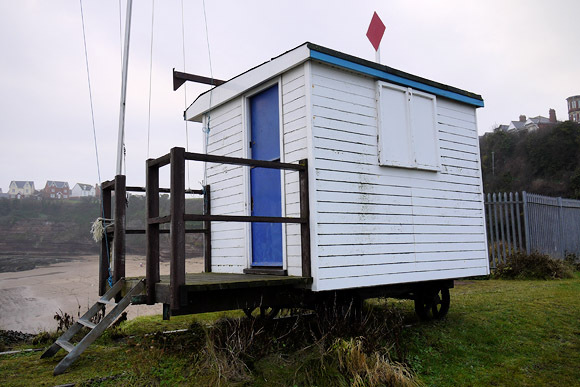 I’m guessing it’s used by fishermen or the adjacent Yacht Club. 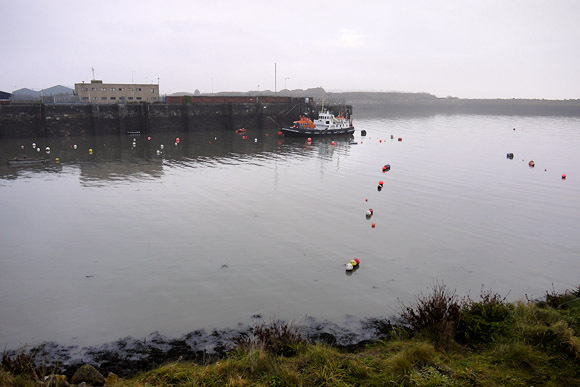 Entrance channel to Barry Docks, with the Lifeboat slipway to the left. Looking south east towards the Bristol Channel. 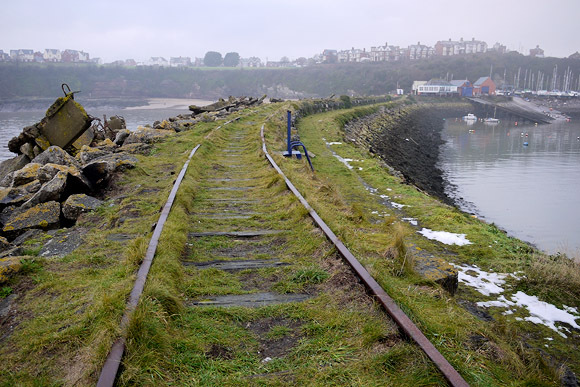 Here you can see the full length of the breakwater and the rusting single rail track. 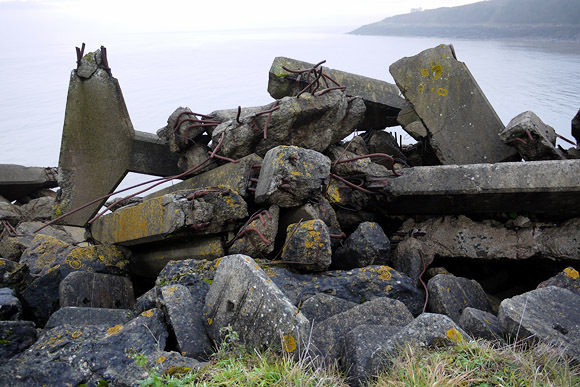 On the western side of the breakwater can be seen a lot of demolished reinforced concrete girders. Looking back to Barry Island (on the left). 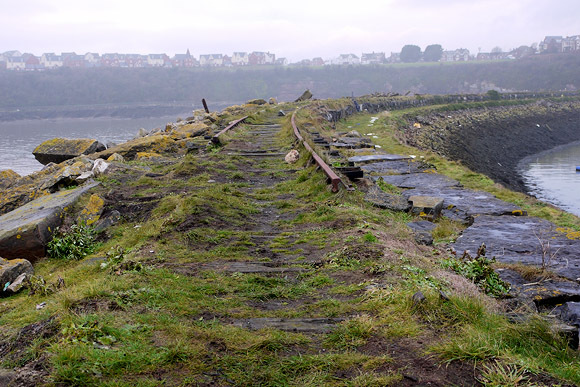 Almost all of the track remains in situ. The unmanned lighthouse at the end of the breakwater. In this close up of the track, you can see the cast chair marked with GWR (Great Western Railway) which dates it to pre-1948. 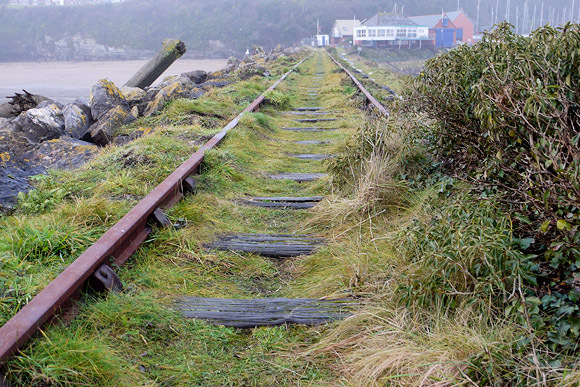 The track is bullhead rail laid on wooden sleepers, and is in fairly poor condition. Fisherman at the end of the breakwater. 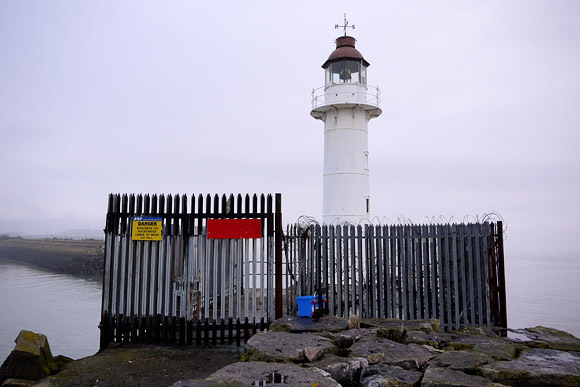 The lighthouse is a circular iron tower, 11.6m high, made by Chance Brothers in 1890. 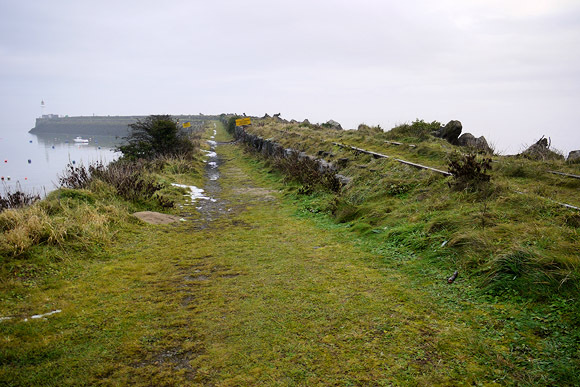 The far end of the track, close to the lighthouse. Looking back to Barry Island. 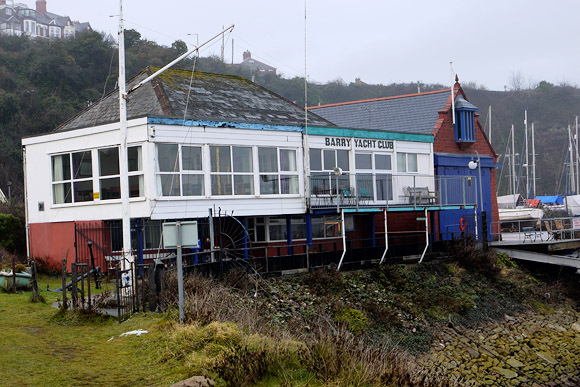 Barry Yacht Club next to the Lifeboat station. 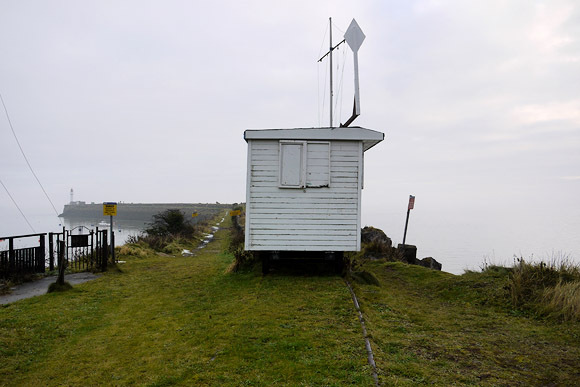 A last look at the strange mobile shed. Looking south along the breakwater, you can see there’s a path to the left of the track. 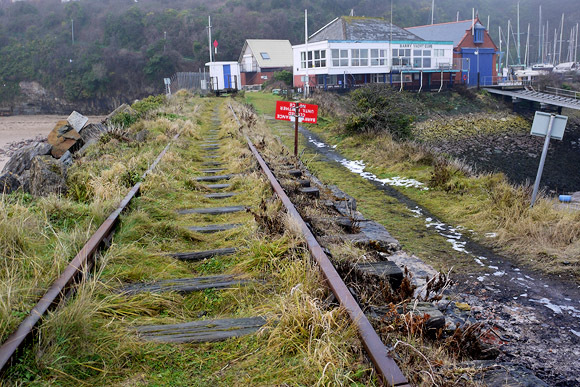 This is possibly where the track ran to join up with the long abandoned Barry Pier station. 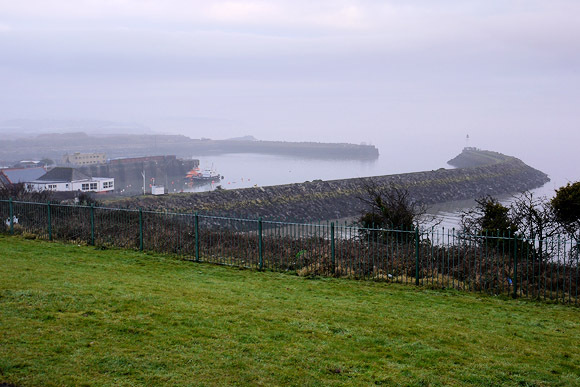 A view of the harbour from Barry Island. 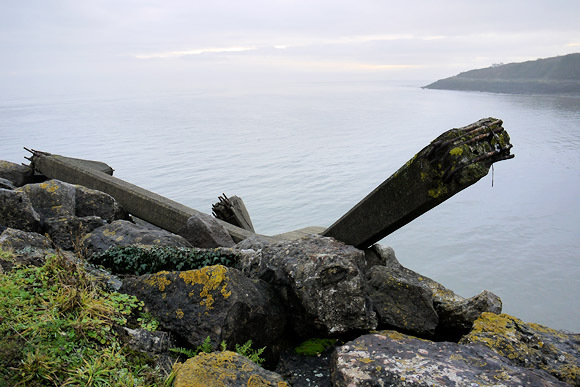 To the west of the breakwater is Jackson’s Bay – this sign warns of falling rocks. 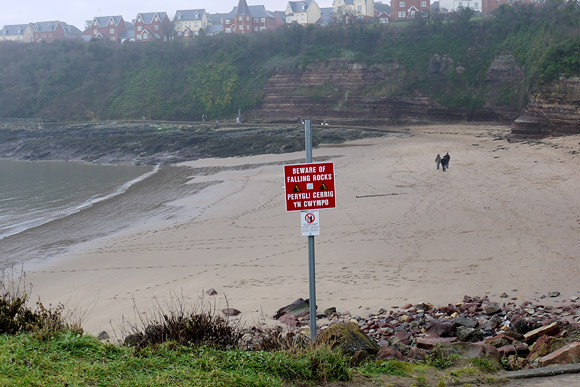 Barry Island is a short 5-10 minute walk from here. Great pics. 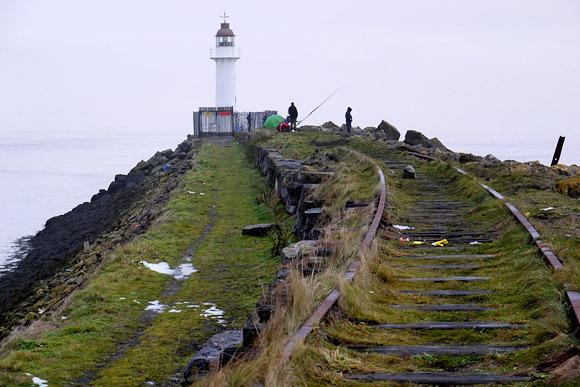 I’ve not been along that breakwater for nearly 40 years. 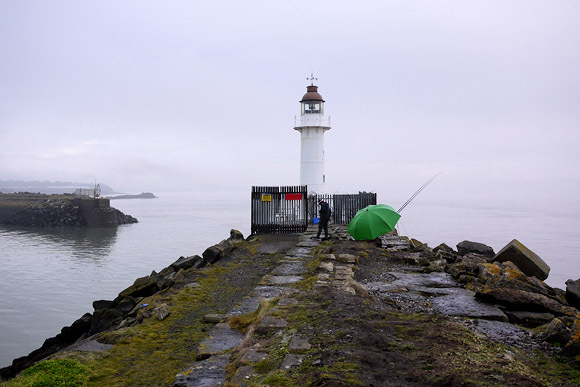 The last time was when I went fishing with some blokes and we cast our lines into the water from the side of that lighthouse which in those days didn’t have a fence around it. I remember the mobile shed and I don’t think even in those days it was in use. 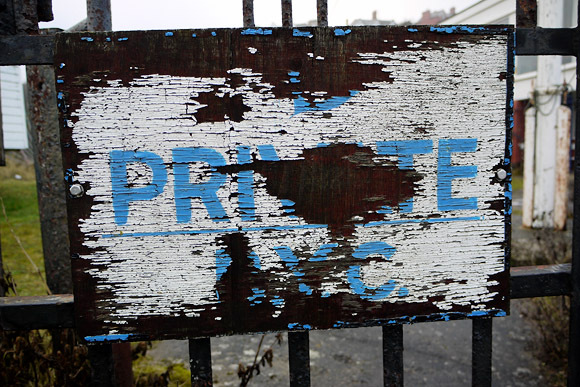 It looks like they’ve kept giving it a regular coat of paint to keep it in reasonable condition. 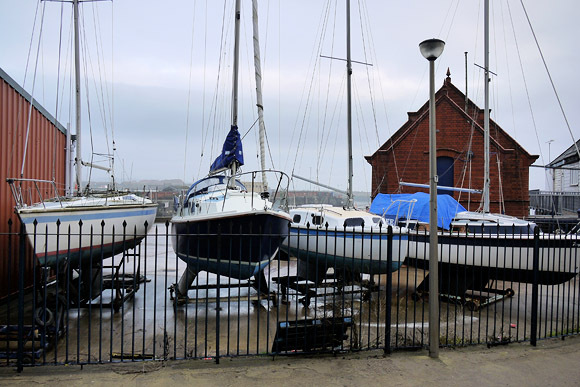 I’ve a feeling the shed was something to do with the yacht club. 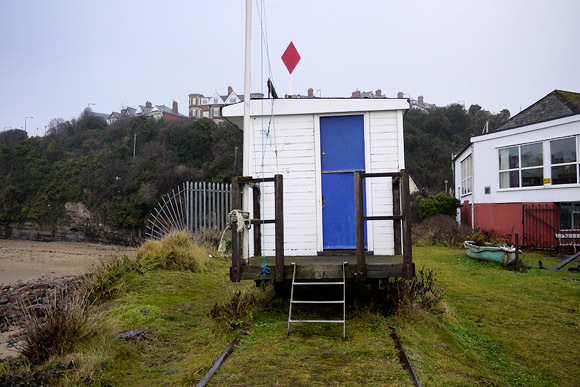 A race official would stand on the shed platform and lower that red flag to start a race. The shed would be pushed out to take the race officials out and back again. Just maybe. 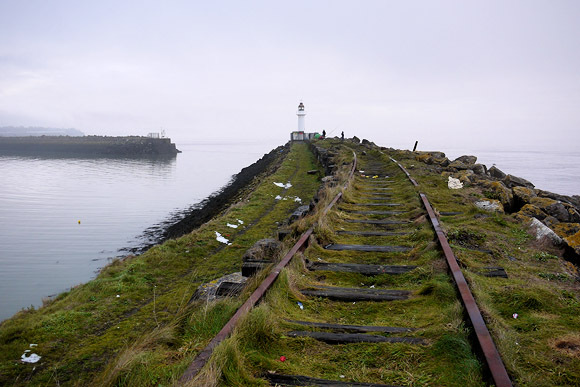 Do you remember the steam engine graveyard that used to be between the Island and the mainland? And the Butlins Holiday Camp? 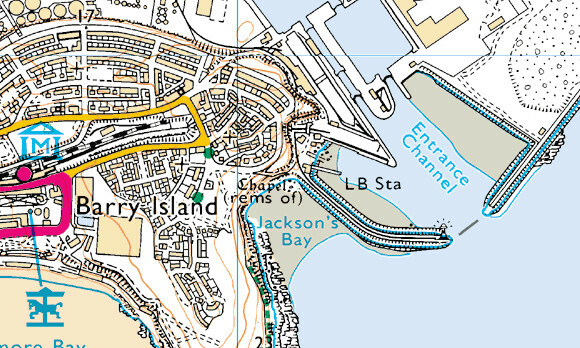 Barry takes its name from the remains of the Chapel that is marked on the map. There used to be a colony of monks there and I think it was supposed to have the remains of St Barac buried there. Barac became Barry. The other was St Cadoc. 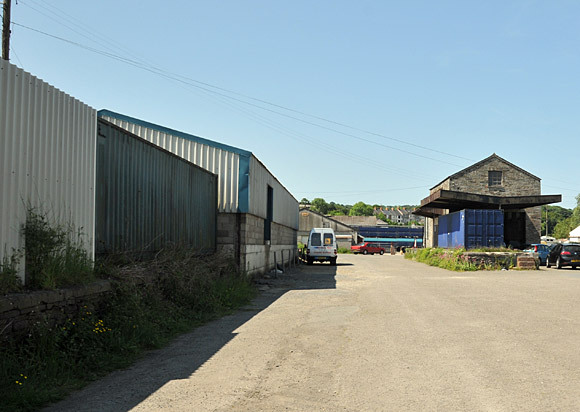 Cadoc became Cadoxton. Barry town grew between these a result of the new railway that was built for the new deep dock to compete with Cardiff docks. This “new” railway took coal from the valleys north of Bridgend and the line was recently re-opened to passenger travel. There is an impressive viaduct through Porthkerry Park at the western side of Barry along from the Cold Knap. Ah memories… And Sully Island in the background of one of the pics. @Linus: I remember the steam engine graveyard well – I used to play in there when I was a small kid and remember how sad all the lines of rusting locomotives looked. Shame I was too young to use a camera at the time! 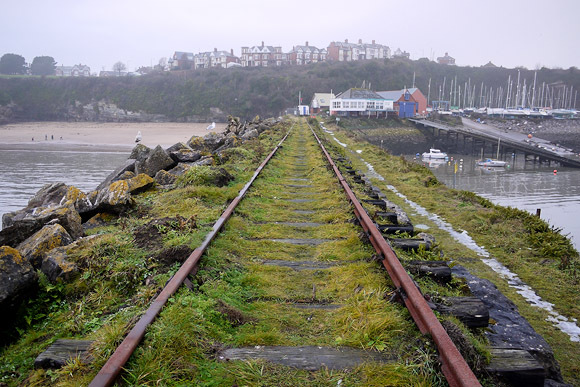 The railway line on the Barry breakwater led to the docks through a short unlined tunnel cut through the cliff near the Eastern entrance to the Barry Pier station tunnel. (now bricked-up.) 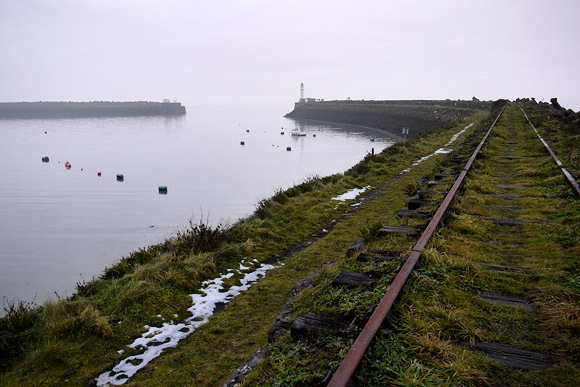 It went across that line on the level, entered the tunnel, then connected with the Dock railway system. The tunnel has been cleared recently sometime in 2008, I believe. 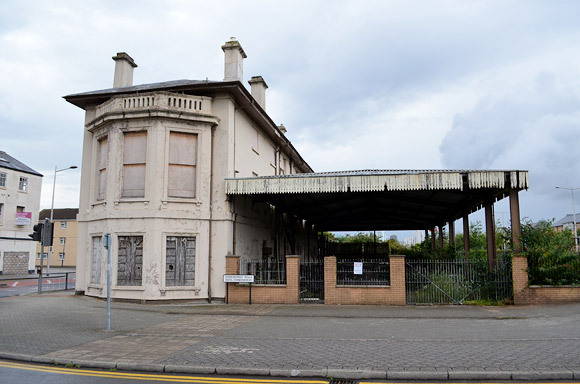 I remember this line in 1954, when I often cycled from Canton,Cardiff to ‘trainspot’ at Barry station. I never saw a train on it. I believe this line is mentioned in a book by Ian Wright on the Barry Railway. My Grt Grd father John Maerdin MITCHELL (1847-1922),was the lighthouse keeper for 32 years. He built the houses and lived at 46 Redbrink Cres over looking the harbour. What dateis the postcard picture? What a shame the tunnel was bricked up and this attraction left to ruin! 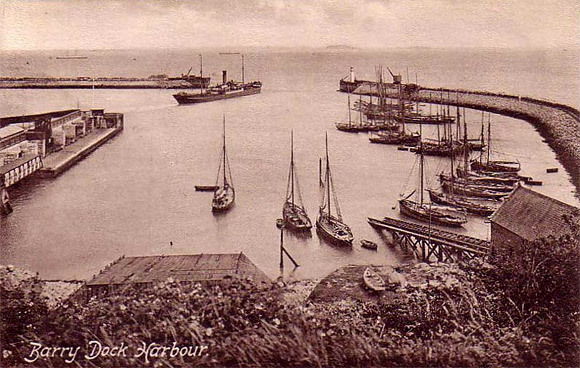 If I won the lotto I’d love to get this going again, with paddle steamer trips from the dock as in yesteryears. 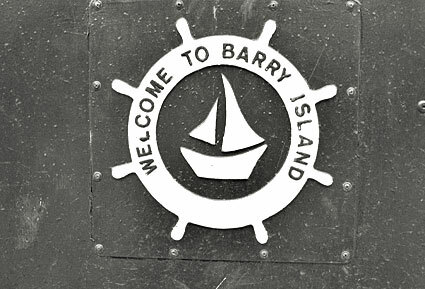 I’ve lived in Barry my whole life and only just found out about this! If you visit other areas around Wales, the coastal regions are being used & busy in numerous ways. It’s a shame our town isn’t taking advantage of it’s popularity. I know many locals and tourists would enjoy summer trips but there’s nothing available as yet. It needs sorting, especially with the popularity of Gavin & Stacey. One New Years Day after the Christmas special I couldn’t move for all the throngs of tourists who were G &S fans! It was freezing but the beaches were packed. 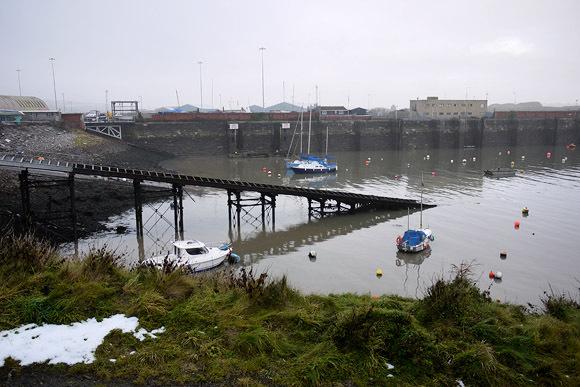 Just found this site and it has broken my heart to see the disrepair my beautiful Jacksons Bay Area is in , I was born on Barry Island 1938 and lived there till I got married in 1959 ,then lived in Barry Dock till 1966 when we came to Adelaide Australia .my maiden name was Margaret Pearson ,I lived in 78 Phyllis Street.if any one who lives on the Island and remembers me , please contact me , I married Lenny Zorrilla from Fryatt Street, but we changed our name to Kent in 1967. Margandlenkent@bigpond.com. 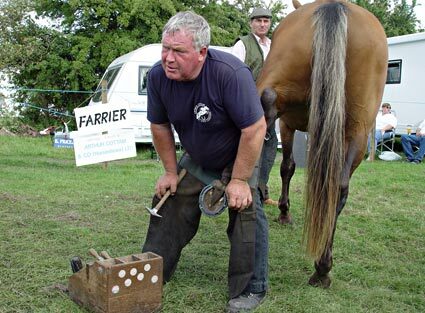 Would love to catch up with gossip of Barry .